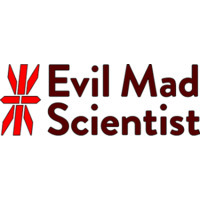 Here at Little Bird Electronics, we carry a range of Evil Mad Scientist products. Evil Mad Scientist Laboratories is a family-owned business in Sunnyvale, California, known for their remarkable DIY and open-source hardware designs, some of the most notable products being the EggBot Deluxe Kit and The EggBot Pro. If we are out of stock of a part, you need, please contact us.